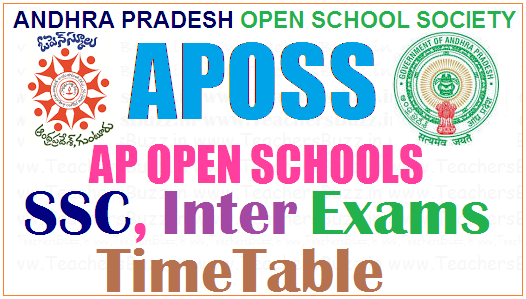 APOSS AP Open School SSC, Inter Exams 2019 Revised Time Table APOSS AP Open school 10th class / intermediate public Exams Time table April 2019 Andhra Pradesh Open School Society Open School SSC, Inter examinations 2019 .APOSS SSC and Inter Exams 2018 Time Table @ apopenschool.org APOSS SSC and Inter Exams 2019 Time Table @ apopenschool.org: APOSS exams time table, APOSS SSC Exams time table, APOSS Inter exams time table, APOSS Inter practical exams time table, AP Open school ssc, inter exams schedule, AP Open inter ssc exams dates, Exams dates schedule for ap open schools 2019. Andhra Pradesh Open School Society has issued SSC and Intermediate Examination April/May 2019/September 2019 Time Table recently. A.P. Open School Society, Andhra Pradesh, Hyderabad, SSC and Intermediate (APOSS) Public Examinations, April/May 2019/September 2019 A.P. Open School Society, Andhra Pradesh, Hyderabad, SSC and Intermediate (APOSS) Public Examinations, April/May /September 2019 Time Table, practical,theory exam dates hall tickets details are given here. A.P OPEN SCHOOL SOCIETY, GUNTUR SSC & INTERMEDIATE (APOSS) EXAMINATIONS 2019. The Director APOSS has given admission notification for this academic year 2019 for admission into 10th class(SSC) and Intermediate courses through distance mode in their Open school study centers. More details will be updated on the official website or available at study centers. The enrolled students have to appear for the examination conducted by APOSS. There will be separate study material and examination pattern for open school system candidates. The degrees will be considered on par with regular candidates. A.P. Open School Society, Andhra Pradesh, Hyderabad, SSC and Intermediate (APOSS) Public Examinations, April/May/September 2019 Time Table provided here. Guntur – 522001, Land Line No: 0863-2239151.